CHANGING LANDSCAPES. The juncture of the North Luzon Expressway, EDSA, and A. Bonifacio Avenue is the new site of an urban oasis in Metro Manila, Ayala Land’s Cloverleaf Balintawak. Over the years, the area has continually evolved from its humble beginnings as an agricultural area, to becoming an industrial zone, and today, as one of Manila’s premier commercial and residential hubs. The location’s proximity and the on-going government-led infrastructure projects would bring Cloverleaf Balintawak to the center—connected to all the main thoroughfares, airports, and both the northern and southern Luzon provinces. Cloverleaf Balintawak strikes a balance among the key components of an urban enclave—residential towers, commercial spaces, office complexes, and even a medical facility. The 11-hectare development will also be home to a landscaped pedestrian promenade that will link A. Bonifacio Avenue with EDSA. The walkway will be dotted with retail stores and restaurants, giving shoppers and pedestrians a safe, al fresco environment – a breath of fresh air from the hustle and bustle of the metropolis. OPENING NEW EXPERIENCES. The vibe of Cloverleaf Balintawak, and the new layouts and right-sized residential units are all at the new sales pavilion of Avida Towers Cloverleaf, bringing guests and buyers into an oasis from the hustle and bustle of EDSA, North Luzon Expressway, and A. Bonifacio Avenue. 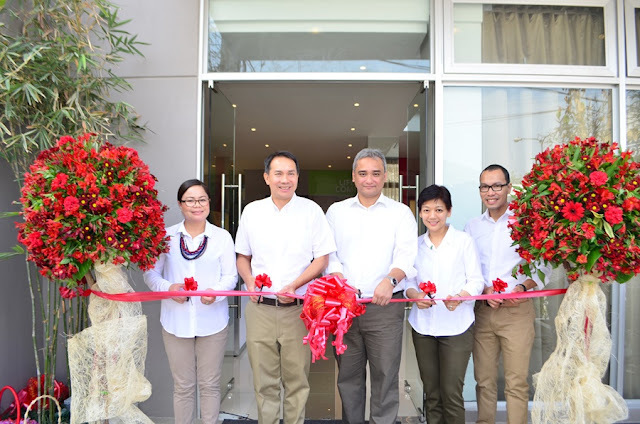 Ayala Land President and Chief Executive Officer Bobby Dy and Avida Land President Christopher Maglanoc (2nd and 3rd from the left) led the ribbon cutting of the new sales pavilion. Also in the photo are (from left) Avida Land Sales and Marketing Head Bing Gumboc, Ayala Land Group Head for Strategic Land Bank Management Meann Dy, and Ayala Land Cloverleaf Balintawak Project Development Manager Jay Teodoro. Ayala Land’s residential projects, Avida and Alveo, are underway, while the construction of a regional shopping mall is also in full swing, which will bring a new lifestyle experience for the people in the area. Cloverleaf Balintawak will also have a 250-bed Qualimed Hospital, a flagship medical facility of Ayala Land’s hospital brand that offers quality, affordable and accessible medical care and services. The Avida Towers Cloverleaf sales pavilion along A. Bonifacio Ave was recently inaugurated, to give prospective buyers an opportunity to experience the development’s new right-sized residential concept for its 2-BR and 3-BR units. Designed to bring out the best of what Cloverleaf Balintawak will offer its future residents, the sales pavilion is like an oasis from the rush that roads of EDSA, A. Bonifacio, and the North Luzon Expressway brings to the area. Like all Ayala Land-led developments, the rise of Cloverleaf Balintawak will also inspire the growth and improvement of the surrounding areas, putting the project in the heart of all the action. The property’s office towers and new business would also mean jobs for local residents, while new residential spaces would mean business opportunities for retail and service establishments. Discover the new look of northern Metro Manila with Ayala Land’s Cloverleaf Balintawak – a refreshing urban masterplanned enclave and its very strategic location, the juncture where the north and south provinces meet in the country’s capital.